You may think: “Who cares! I’ve got unlimited traffic.” But what if someone reading your personal emails, stealing private information or breaking the law online while using your Internet connection? Here comes our little application that allows you to know immediately if your network is used without your knowledge. 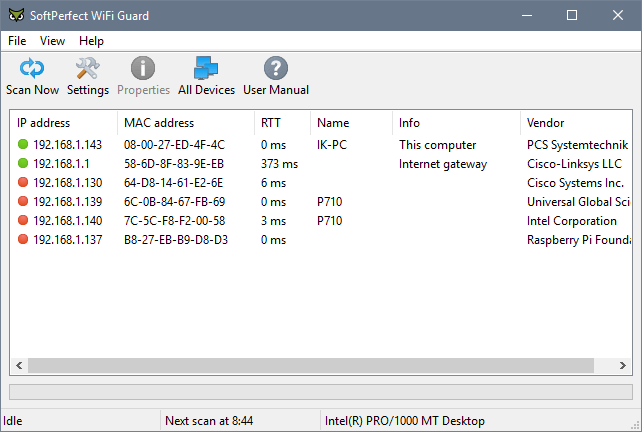 It is a specialised network scanner that runs through your network at set intervals and reports immediately if it has found any new connected devices that could possibly belong to an intruder. 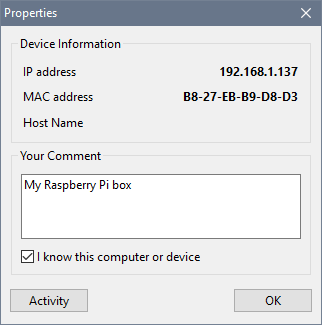 The columns show IP and MAC addresses of detected devices, round-trip time (how long it took the remote device to respond; also known as the ping time), hardware vendor and additional information. From here you can click the Scan Now button, return to the Settings or see All devices ever detected. 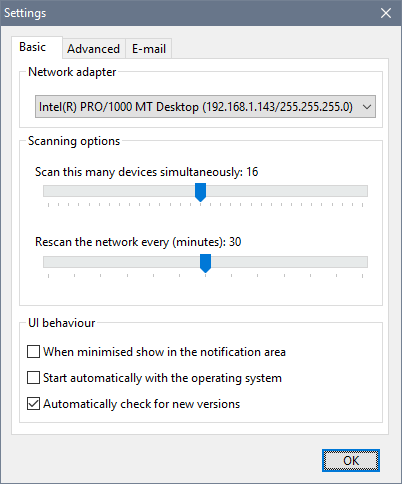 Click Scan Now to detect all your network devices. This will scan your WiFi network and display what is there. It may take some time, depending on the size of your network. Once the scanning process has finished, you will see a list of devices, including your computer, your router and possibly some other devices. Your computer and your router will be marked green straight away, because WiFi Guard already knows they are legitimate. The devices marked red represent everything else: other computers, smart phones, TV, Xbox, etc. These are red because WiFi Guard doesn’t know yet whether they have your permission to connect to your network. Example of scan results of a small network: two devices were automatically marked as known and the other four as unknown. 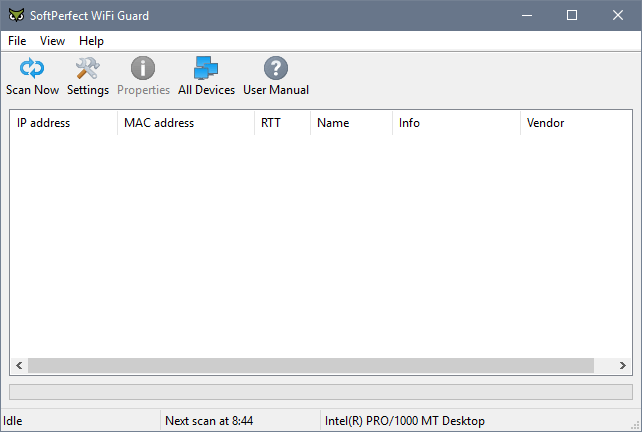 The whole idea of WiFi Guard is that you mark all your devices as “known”, and this will allow you to spot new devices in the network that are not yours or should not be there. The simplest way to identify the devices would be to think of what in your place has access to the Internet. If the device is hard to identify from its detected name, turning various devices off and on one by one will help to find out what is what. If you still have no idea what some devices are, it makes sense to change your WiFi password in your router to stop them from using your network. If you identified all the devices as yours — great: your network is not compromised. 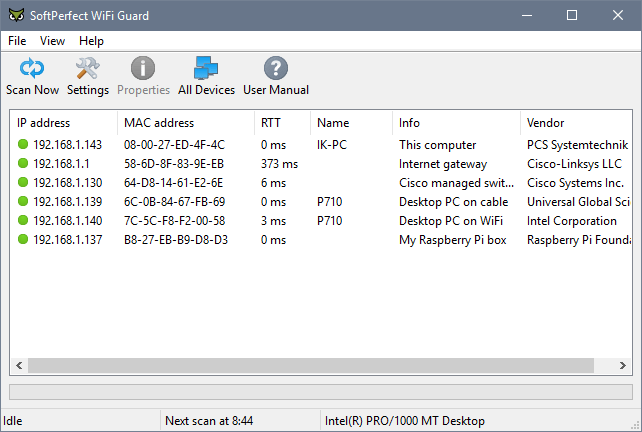 From now on you can either run WiFi Guard periodically to detect any new devices in the network, or better configure it to run when the system starts and then scan your network every 30 minutes or so. In the event of detection of unidentified devices in your network you can act accordingly: mark them as known if they are yours, or change your WiFi password if those appear to be strangers. Still have questions? Check out the how-to articles or drop us a line.